WTI clings to 4-month high after a surprise drawdown in API oil data. On Tuesday, American Petroleum Institute, released its weekly crude oil stock report which mentioned a surprise draw of -2.1 million in inventories to 446.8 million versus market expectations of +0.3 million addition at the end of the week to March 15. While supply-side forces support bulls, doubts over future demand challenge the sentiment, one key factor contributing to the same is uncertainty surrounding the US-China trade deal. Looking forward, the official oil stock change report from the US depart of Energy's Energy Information Administration wing will be crucial for WTI traders. 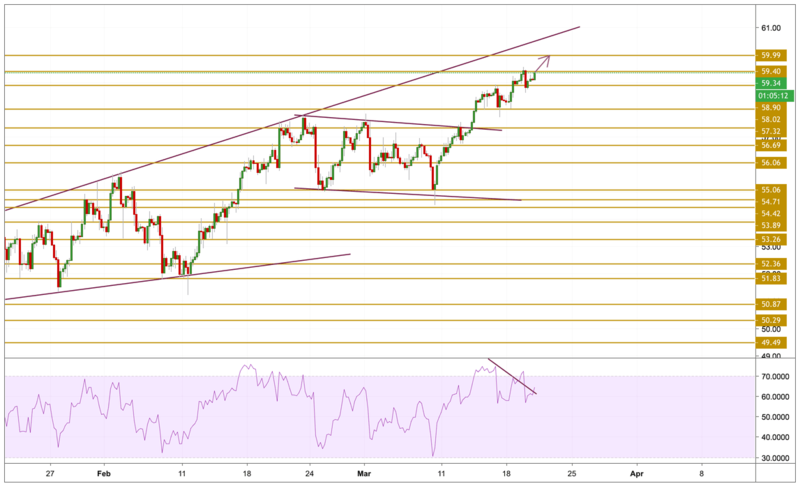 WTI prices broke to the upside and surged towards a new yearly high of $59.55 per barrel after being capped below the $58.9 resistance level. The price is currently trading just below the $59.4 resistance level and looks set to surge towards the $60 level with a bullish momentum.